Fudgy chocolate chip cookie with a hint of hazelnut and chocolate spread made in an iron skillet. It’s Secret Recipe Club group A reveal day. If you’re curious what the SRC is it’s kinda like the bloggy version of secret Santa. Each month you’re given the name of another blog and it’s your job to find a recipe that you’d like to make and blog about it. It started out with around 19 bloggers and was once a month and has grown to a group of around 300 and 4 groups. Bizzy Bakes was the blog I got this month Sweets were the first thing I searched for because I haven’t posted a dessert in months. I was torn between the chocolate fudgy cookies and the chewy chocolate cookies but ultimately decided on the fudgy ones when I noticed the recipe called for chocolate hazelnut spread. The first batch of these I made the traditional way, then I decided to try something a little out of the norm. I remembered seeing a skillet chocolate chip cookie on a friend’s blog and decided to try that. A gooey chocolate chip cookie baked in a skillet. In a medium bowl, beat the butter and sugars together until light and fluffy. Add the eggs, one at a time, mixing well between each addition. Stir in vanilla and chocolate spread. Add dry ingredients to the creamed mixture and stir. Mix in the chocolate chips with a spoon. Place dough in the bottom of an oven proof skillet. I used cast iron. Bake at 350 for approximately 30 minutes. The cookie should still be slightly gooey in the middle and the edges set and browning. Cool on a rack, cut into wedges and serve. Verdict: The regular cookies were wonderfully fudgy, chewy and gooey and the skillet version version seemed extra fudgy, chewy, and gooey which I think the best chocolate chip cookies are. Thanks for the great recipe Chaya! I am thrilled. you liked this and I am excited about what you did in the cast iron pan. Of course, I am going to do this, too. What a great idea. I would have gone for the recipe with Nutella too, Yummy looking. I love skillet cookies! If you haven’t already, I’d love it if you’d check out my SRC pick this month: Dark Chocolate S’mores Pie! This looks so good, I would love to dig right into it right now! Yummy Yum Yum!!! That looks so incredible, and I love the skillet idea! Anything with nutella is awsome!! Thanks for sharing! Yum! 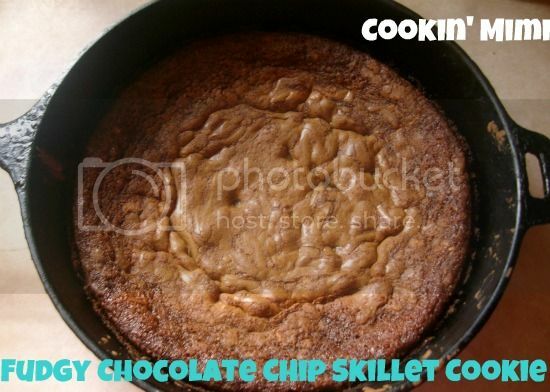 I’ve been wanting to try a skillet cookie for a while, this looks great! Mmm, that looks great in a skillet! And sounds like a great recipe! Love it! This looks so good. My kids will love this! Thanks for linking to the Weekend Potluck!